January 9, 2012 — . Let’s open the 2012’s calendar with something different from typical celebration! What about the idea of rose? Universally, rose symbolizes love. Universal love is limitless. Limitless love can be love given to the religion and to all beings which it’s called loving kindness. If we could love all beings, our path of life would be paved by roses. So lets create a rose way to make a new rose year in 2012. At every special occasion, people are looking for special things to celebrate. Look at the beauty of roses, let the floral freshness quench our mind to be clean and beautiful, not allow it tainted by any old unwholesome memories in this auspicious season. Rip the rose petals and keep them fresh to add more auspiciousness. 1127 Buddhist monks will walk on pilgrim on a length of 365 kilometer to bless people on this worldly greetings season. The entire 365 k route will be scattered by multicolored rose petals to unbrokenly pave the rose way for the righteous pilgrim monks to walk on. The event indicates that the 365 days of the New Year, the participants’ life will fill with happiness and success without difficulty. Thousands of people and school students take part in this joyous and sacred activity. At the same time, the act of pilgrimage is one of the 13 Dhutanga practices of the Taravatta Buddhist monks. In the Buddhist society, after the Rains Retreat, monks are offered the Kathina Robe before they are preparing for Dhautanga. In the old days, this austere practice was emphasizing on the journey within the secluded forests. In modern days, the practice has been adjusted. 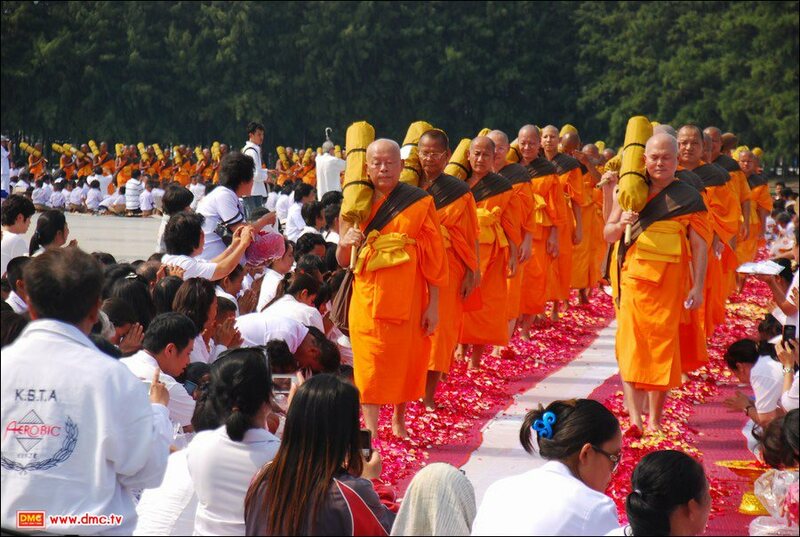 The 1,127 monks will walk pass through 6 recently inundated provinces around the central part of Thailand. Their performance intends to nurture the wrecked mind of the flood disaster with the power of their loving kindness. The purity power of their cultivated mind serves as a big spiritual cleaning to all. The pilgrim route covers the provinces of Ayuthaya, Pathum Thani, Nonthaburi, Nakornpathom, Supanburi and Bangkok. Yet, it contains another essence related to the Great Meditation Teacher of Vijja Dhammakaya named Phra Mongkolthepmuni. The designed route tracks back his life history. This noble journey commenced on 2nd of January and will last till 25th of the month – a total of 24 consecutive days. The starting point is Dhammakaya Temple in Pathum Thani Province.